Hello my little lovers (I actually NEED a proper name for my readers - there is a little suggestion box below (a.k.a the comment box) so let me know! Apple Apostrolou is all alone. 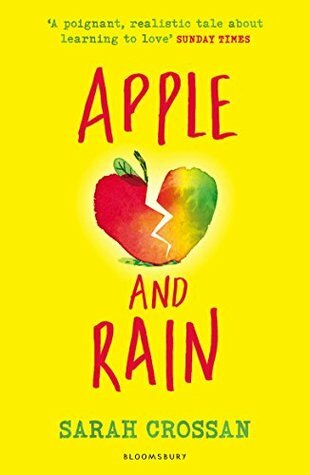 Her dad is wrapped up in his own life, and couldn’t care less about his daughter, and her mum ran off to America to pursue her dream of acting, dumping Apple with her Nana, who, may be nice but is way too over-protective, and becoming a huge embarrassment. And as for school, her ‘so-called’ best friend Pilar, has ditched Apple for Donna, the super-popular girl, who tries to convince Pilar that Apple is no-good and babyish. It works. All Apple has now is hope. And when her mum comes back out-of-the-blue, Apple is delighted, although maybe it isn't such a great thing after all. This is one of MANY books featuring dysfunctional mothers (other ones are Lily Alone and Scarlett Ibis, to name a few), yet it seems completely different! But to me, Apple And Rain had a different heartfelt emotion range that others lack. It had an ability to make me feel an emotion only 4 other books have (my 4 favourite books - which by the way are A Year Without Autumn, Wonder, Forbidden Friends and Butterfly Summer). The plot was poignant and when I was reading, I thought it was very predictable, but Sarah Crossan provided us with a couple of very big plot twists! It's also been nominated for the Guardian Children's Fiction Book Prize 2015 (which you will have seen if you read this blog post here), and I hope it wins! Overall, I'd recommend to all older readers, particularly fans of Gill Lewis and Cathy Cassidy! I've read so many 'teen level' books with mothers who are dead or run off and hat sorta thing. One book I've really enjoyed with that type is 1+1 = Blue. I'll have to read this book! Yup, I totally agree! I really must check out 1 + 1 = Blue! Yes, it is wonderful - I think you'd LOVE it! I love the sound of this book, I really like it when books create some sort of emotion with me - definitely going to give it a read! I'm sure you'd love it!